The Red Sox sent the series back to New York with their second straight extra-inning victory, and David Ortiz’s second walkoff hit in less than 24 hours. This time, he singled in the bottom of the 14th to drive home the winning run almost six hours after the first pitch of the game was delivered. Dan Shaughnessy: New England is at once sleepless, breathless, and full of hope. 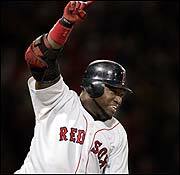 David Ortiz and the Red Sox just beat the Yankees in two extra-inning playoff games on the same calendar day. This century-long Sox-Yankee show, featuring themes of revenge and redemption, moves back to New York tonight. Bob Ryan: Where to start in this latest endless epic?